Who suffers from cuts to public services? The public. When the Ontario government sent an internal memo announcing a hiring freeze for the public sector early this summer, they set the province on a course for reduced public services and more precarious jobs. These changes will have a deeply negative effect on the quality and accessibility of public services and will directly affect tens of thousands of workers and their families. “Quality public services mean quality of life for Ontarians,” said Ontario Federation of Labour President Chris Buckley. “Without well-managed public services, Ontarians won’t be able to count on safe and strong regulation of services like health care, education, hydro and, when it is available, the sale of cannabis. All of these services must be owned by the people of Ontario rather than private companies that can’t be well supervised and regulated,” he added. The Ontario Health Coalition has worked with grassroots groups to successfully save local hospital services, improve health care and stop privatization. 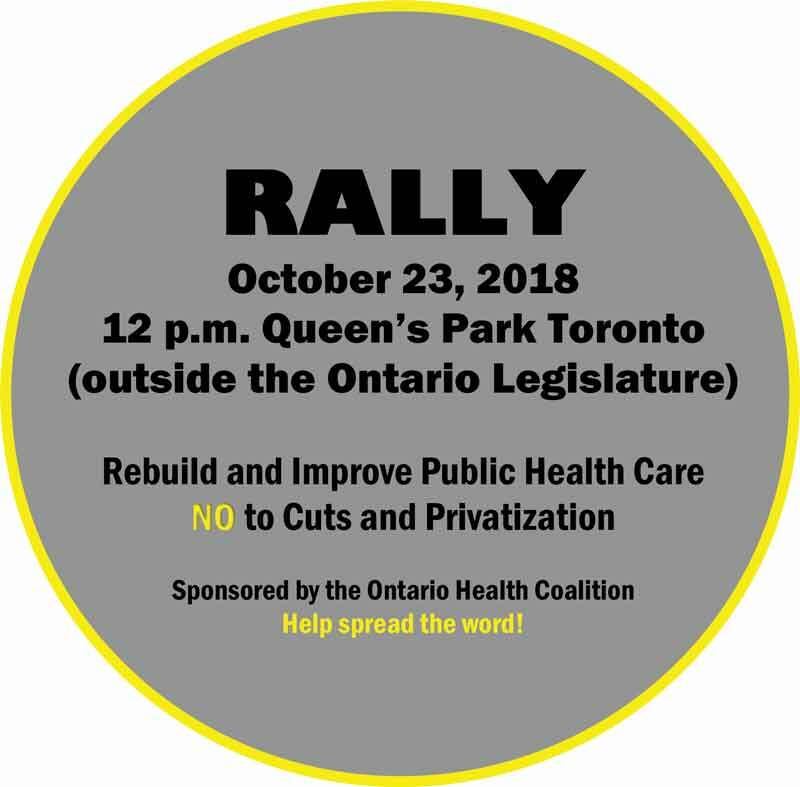 The OFL sat down with the Ontario Health Coalition’s executive director, Natalie Mehra, to find out why the organization is planning a big rally at the Ontario Legislature on Tuesday, October 23. You have been very vocal, warning the government not to cut health care. What are you warning about? For decades, Ontario’s governments have cut hospitals without mercy. Today, we have the fewest hospital beds left of any province in Canada. By that I mean hospital beds that are funded and staffed with nurses, health professionals, support staff and doctors. There are wards, floors, even entire hospitals closed and empty while people are waiting on gurneys in hallways. Operating rooms are closed, but there are thousands waiting for surgeries. In fact, Ontario has dropped to the lowest hospital funding in the country. We now have the least nursing care per patient, and it’s getting worse. Our hospitals move patients out “quicker and sicker,” and we have the highest readmission rates. One in 10 patients ends up back in hospital. The evidence is overwhelming that we can’t take any more cuts. But in a Toronto Star interview, the new health care adviser appointed by Premier Doug Ford talked about continuing the same policies of closing down hospital services. The public overwhelmingly does not support this. It would be a disaster. What would make the most difference immediately? Our new government must restore services. Last fall, the government finally reopened 1,200 closed beds. Now, under the new government, the funding, even for those temporary beds, is at risk. It needs to be made permanent, and we need more beds, ORs and services reopened. In addition, we need more nursing home spaces opened, and we need a regulated care standard that says that every resident in a nursing home will get a minimum of four hours of hands-on nursing and personal care each day. As of December, there were 30,000 Ontarians on wait lists for nursing homes, and care levels are too low for those in the homes now. This is vitally important for seniors with dementia and the frail elderly and their families who are really suffering. How can Ontarians get involved to protect their health-care system? Regular Ontarians need to tell their MPPs – no matter what political party – that we need public hospital services restored and we need improved long-term care. We need to be clear: no more cuts, period. It makes a difference, truly, when they hear from lots of us all together. People can call/write their MPP and join us at a big public health-care rally on October 23. What would privatization in the health care sector mean in Ontario? Canadians are rightfully proud of our public health care. The Canada Health Act requires that health care be publicly funded so people are protected from huge medical bills when they’re sick. Corporations contribute through taxes, people contribute, and together we provide health care as a compassionate and equitable program. It’s far less expensive than private health care in countries like the U.S. But when there are cuts and private clinics take over our public hospital services, they charge hundreds or even thousands of dollars in illegal user fees to patients – on top of billing OHIP – for services for which we have already paid in our taxes. They charge far more than public hospitals for services. Privatization hurts patients. Public care is better. For example, public and non-profit nursing homes provide more hours of care. They take extra fundraising and put it into programs for the residents rather than taking profits out. Ontarians want health care protected and improved, not cut and privatized. We’re going to the Ontario Legislature on October 23 at noon with thousands of people, and we’re going make sure that we get across this message very strongly. Everyone who cares about health care is invited!